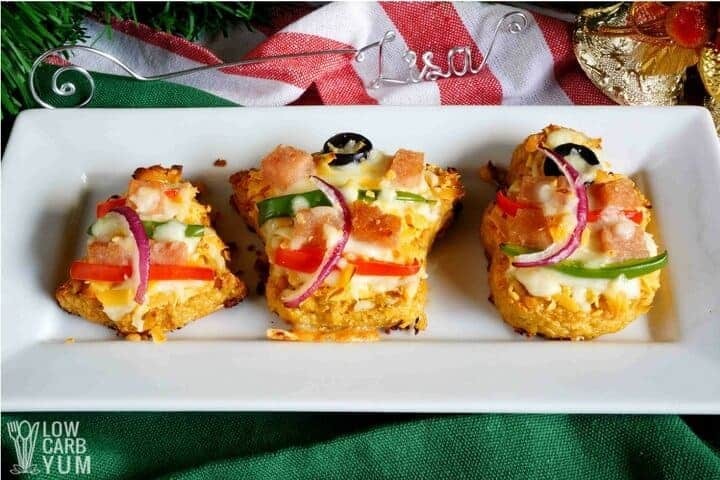 Celebrate with keto friendly cauliflower pizza bites made in festive shapes. 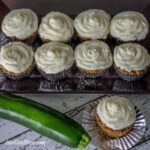 They can even be prepared in advanced and heated just before serving. Are you the kind of person who likes to use food as decorations for celebrating holidays and special occasions? I think it’s great to have food match any party theme. Our family always makes sugar cookies for every holiday. So, we have quite a collection of cookie cutters. 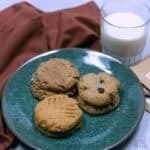 But, these cutters can be used for more than just cookies! Today, I’m going to show you how easy it is to make cauliflower pizza bites into festive shapes. I used Christmas cookie cutters and topped the mini pizzas with holiday colors. At first, I spread the cauliflower pizza crust dough out on a baking pan and cut out shapes. However, then you have to remove all the extra cauliflower mix from the pan. A much easier way is to lay the cookie cutters on the baking pan and then fill the cutter with the crust mix. This way, you have control as to how thick or thin the crust is. If you want a thick crust, fill the cutter all the way to the rim. For a thin crust, only fill the cutter halfway. Personally, I prefer the thinner crust and you’ll make twice as many. 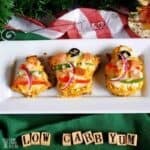 The best thing is that you can make these cauliflower pizza bites in any shape you want. And, if you hoard cookie cutters like we do, you should have no trouble finding shapes you want. Because I was making Christmas appetizers, I used red and green bell pepper along with some ham. For some added color and flavor, I added in some onion and black olives. 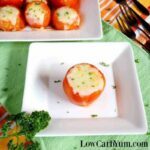 Since Edam is a popular cheese for Christmas in the Philippines, I used it to top off the keto pizza bites. It doesn’t melt very well so I blended in some grated mozzarella cheese. Of course, you can use any cheese you prefer for these tasty appetizers. We also like to mix in provolone, parmesan, and even cheddar. So, feel free to mix it up. Although you don’t need to use a sauce, I like to add a thin layer of my homemade no sugar added pizza sauce. 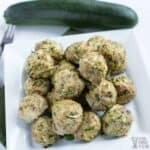 You can also use a low carb marinara sauce instead. 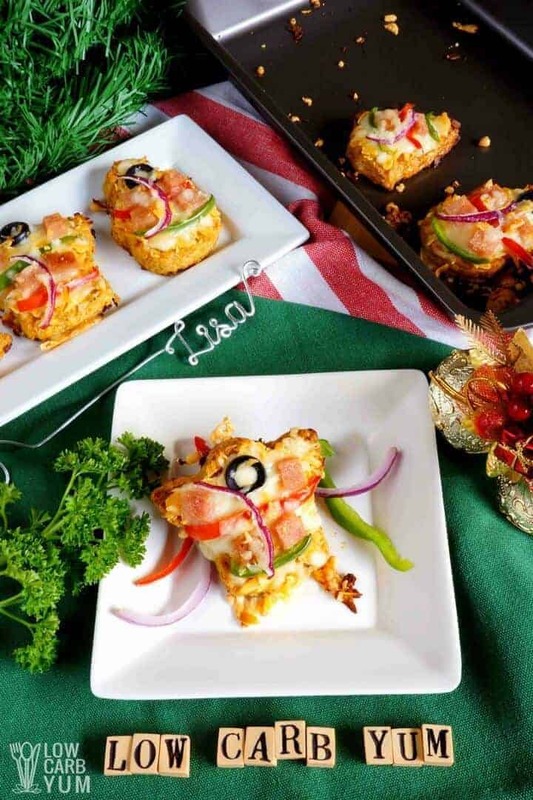 Once you give these cauliflower pizza bites a try, you’ll want to make them for all your special occasions. And, You can bake up the crusts ahead and add toppings. You’ll just need to heat them right before serving. 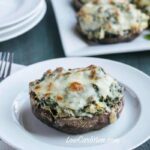 You should also be able to freeze the baked crusts with toppings and bake the keto pizza bites frozen. I haven’t tried this yet, but I don’t see why it wouldn’t work. 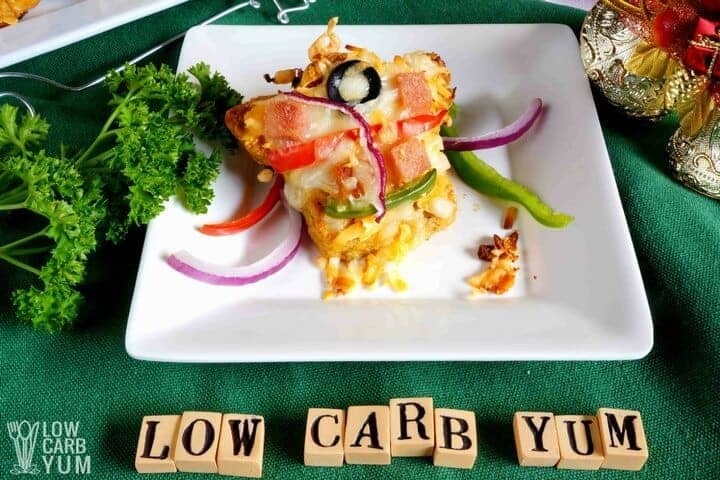 Another great idea for low carb pizza bites comes from my friend Katrin at Sugar Free Londoner. 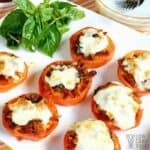 She makes crustless mini pizzas using baked grated mozzarella cheese as the base. 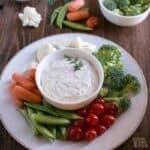 And if you’d like another great keto friendly appetizer, be sure to check out my cheese dip. 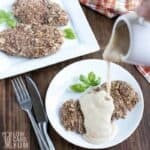 I like to serve it with pork rinds, but low carb tortilla chips are another option. 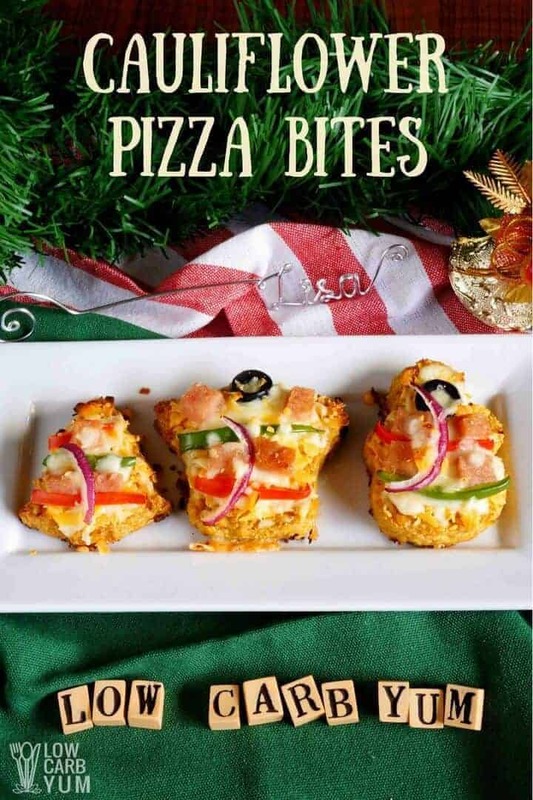 Celebrate with keto friendly pizza bites made in festive shapes. They can even be prepared in advanced and heated just before serving. Strain excess liquid of riced cauliflower. In a bowl, combine riced cauliflower, beaten egg and Edam cheese. Add mustard seed, sage, oregano, thyme and black pepper. Mix well. No need to add salt since Edam cheese is usually a bit salty. In a baking sheet, spread cauliflower mixture. Using Christmas Cookie cutters, fill with cauliflower mixture. If you prefer a thick pizza, fill the cookie cutters to rim. If you want a thinner pizza, fill only half and then flatten with the back of the spoon. In a greased baking sheet, bake queso de bola cauliflower pizza bites in a preheated 350F oven for 6 to 8 minutes. 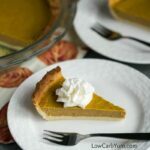 Avoid browning too much as you will bake this again with the rest of the ingredients. Allow to cool for handling. 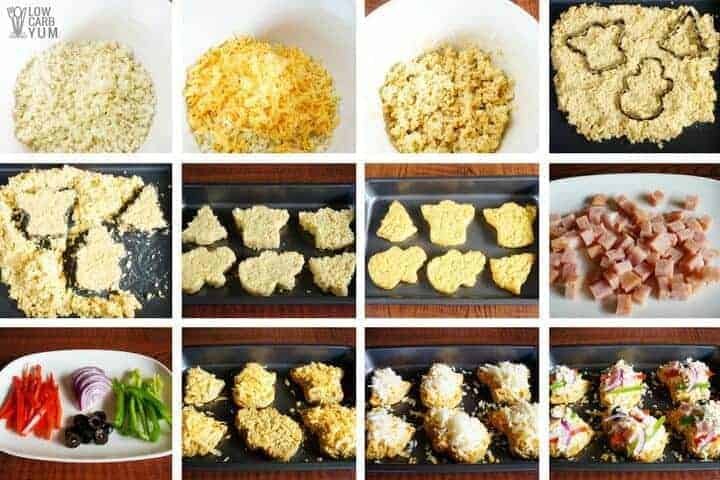 Arrange pizza bites. Spread a thin layer of Homemade Sugar Free Pizza Sauce, add grated Edam and mozzarella cheese. Top with red and green bell pepper, red onion and ham pieces. 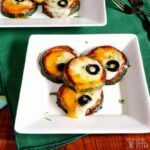 For Christmas shapes like the Snowman and Angel, add a slice of black olives at the upper part – resembling the portion of the head. Top with more mozzarella as desired. In a preheated 350F, Christmas pizza bites for 5 to 8 minutes or until cheese has melted and a bit golden. Edam cheese may become a bit crunchy as it doesn't easily melt.